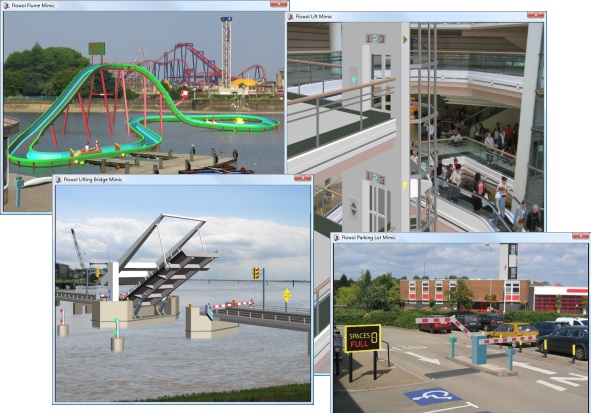 Add on for Flowol 4 School Licence with 4 additional 3D animated mimics: Parking Lot, Lifting Bridge, Elevator and Log Flume. Add 4 additional 3D mimics to Flowol 4 with the Secondary 3D Mimic Pack 1. The 4 mimics are the Parking Lot, Lifting Bridge, Elevator and Log Flume. They provide a progression which uses advanced programming and control systems features. The mimic pack includes an activity booklet with an activity sheet for each mimic. These can be printed out and used in the classroom. These mimics are suitable for students of 7th grade and above. The Parking Lot Mimic gives students the opportunity to explore the control features of automatic parking lot barriers. Input switches on the ticket posts and pressure mats can be used to operate the articulated barrier. A variable can be used to count the cars [in and out], control the Full sign and illuminate the seven segment display to indicate the available spaces. 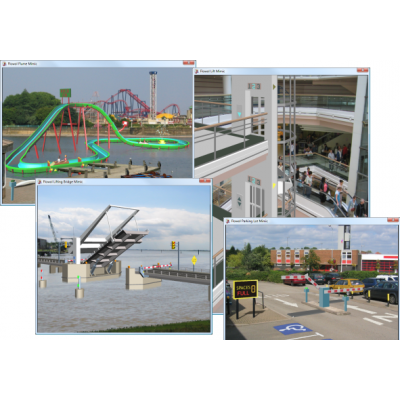 The Bridge Mimic gives students the opportunity to explore the operation and safety features of a lifting road bridge. The beacons and road signals can be controlled and the left and right road barriers operated separately. The main bridge and barriers each have virtual input switches to detect when they are fully open or closed. The Elevator Mimic gives students the opportunity to explore the control features of an elevator. The position of the elevator is detected by virtual sensors on each floor. These can be used to stop the elevator accurately and operate the floor indicator lights. By combining the inputs from the call buttons and position sensors, the elevator's movement can be controlled. When the doors operate, warning messages can be added by using the sound files included with the mimic. The Flume Mimic gives students the opportunity to explore and control the excitement and safety of a theme park ride. The sign, camera and fountain can be activated by the virtual inputs tripped by the moving logs. The log movements can be controlled by gates and feedback switches. [Initially choose one log with two gates and then introduce two logs with three gates]. The mimic pack includes an MSI for installation on networks.